Refreshed look, same great taste! Our package design is as high-quality as what's inside. Look for Honeysuckle White® clean, eye-catching packaging in stores today. 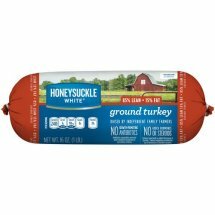 Honeysuckle White® Turkey products include no growth-promoting antibiotics—just honest, simple Turkey. Antibiotics responsibly used only when needed for treatment or prevention of illness. See HoneysuckleWhite.com.